Mitchell's Map of Illinois Exhibiting its Internal Improvements, Counties, Towns, Roads, etc. An extremely rare 1838 map of Illinois by Samuel Augustus Mitchell. It covers the state of Illinois along with parts of neighboring Indiana, Kentucky, Missouri and the Wisconsin Territory. The map depicts a very early county configuration and notes towns, canals, railroads, rivers and a host of other important features. This particular map is extremely scarce and unusual, as it is the first appearance of Mitchell's Illinois maps and predates Mitchell's partnership with Thomas Cowperthwait. 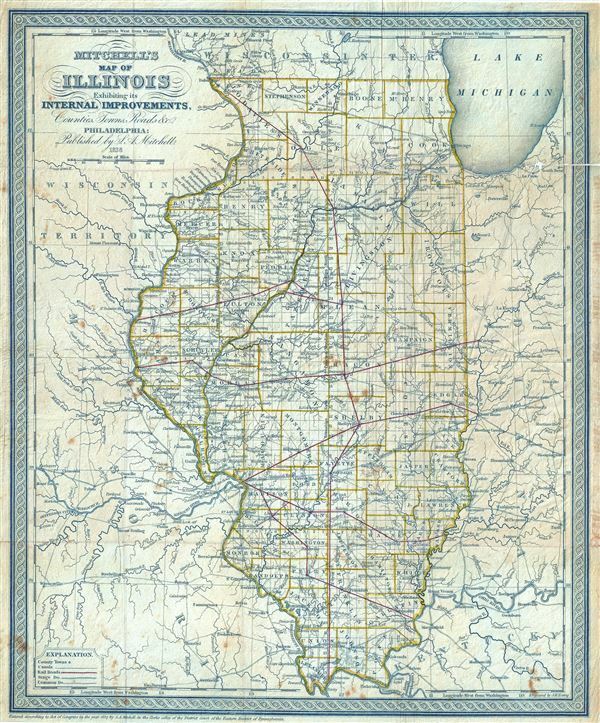 An independent issue meant to accompany and illustrate the book Illinois in 1837, A sketch, all following maps of Illinois by Mitchell followed this template. This is also the earliest appearance of Mitchell's standard c.1850 border. The map is copyrighted to 1837 with a secondary date of 1838. Engraved by J/ H. Young and ''Entered according to Act of Congress in the year 1837 by S. A. Mitchell in the Clerks office of the District Court of the Eastern District of Pennsylvania.' Issued as part of the book Illinois in 1837, A sketch, published in Philadelphia in 1837 by S. Augustus Mitchell and Grigg and Elliot. James H. Young (1792 - c. 1864) was an Irish-American draughtsman, engraver, and cartographer active in Philadelphia during the first half of the 19th century. Young was a pioneer in American steel plate engraving, a process superior to copper plate engraving due to the increased durability of steel. His earliest known maps date to about 1817, when Young was 25. At the time he was partnered with William Kneass (1780 - 1840), as Kneass, Young and Company, a imprint that was active from 1817 to 1820. He then partnered with with George Delleker, publishing under the imprint of Young and Delleker, active from 1822 to 1823. Young engraved for numerous cartographic publishers in the Philadelphia area, including Anthony Finley, Charles Varle, and Samuel Augustus Mitchell, among others. His most significant work includes maps engraved for for Anthony Finley and later Samuel Augustus Mitchell. Mitchell proved to be Young's most significant collaborator. The pair published numerous maps from about 1831 well into the 1860s. In 1840 he registered a patent for an improved system of setting up typography for printing. Mitchell, S. A., Illinois in 1837, 1837. Very good. Printed on onion skin paper. Minor wear along original fold lines. Backed with archival tissue for stability. Minor overall toning and light foxing at places.